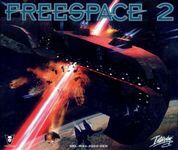 FreeSpace 2 is a 1999 space combat simulation computer game developed by Volition, Inc. as the sequel to Descent: FreeSpace - The Great War. It was completed ahead of schedule in less than a year, and released to great critical acclaim. Engrossing gameplay, excellent sound effects in addition to the inclusion of vocal talent such as Robert Loggia and Ronny Cox led several gaming sites to have proclaimed it as the definitive simulation game for 1999. Source: Wikipedia, FreeSpace 2 , available under the CC-BY-SA License.